Published monthly, Nursing Management Magazine , The Journal of Excellence in Nursing Leadership, is an award winning, highly respected journal publication that is the primary source of practical, cutting edge information for nurse managers who lead nurses across the continuum of care. Nursing Management Magazine provides strategic professional information and services that nurses need to excel as healthcare leaders. Each issue pf Nursing Management Magazine features convenient continuing education opportunities specially geared to its readership, including special staff development offerings. 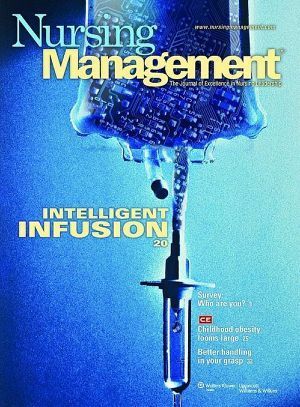 Nursing Management magazine places special emphasis on the new skills needed to succeed in today's tumultuous healthcare arena and prides itself on being a strong, independent platform for the expression of a broad range of opinions and views. Nursing Management Magazine remains devoted to nursing leadership concerns, including nursing staff recruitment and retention, reimbursement issues, legal considerations, regulatory compliance, and professional development that aids in improving staff competencies. Nursing Management Magazine also addresses health and safety issues for nurses and patients, to name a few timely topics. In 2008, Nursing Management Magazine received two awards from the American Society of Healthcare Publication Editors (ASHPE).